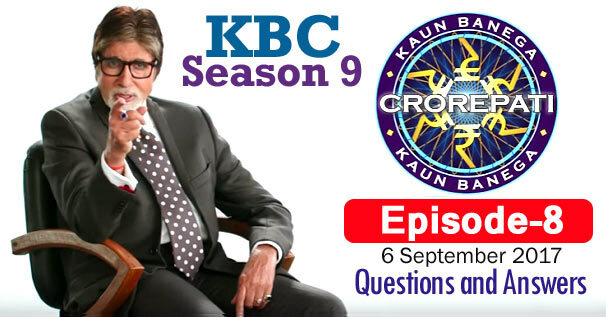 KBC Season 9 Episode 8 Questions and Answers: The eighth episode of Season 9 of Kaun Banega Crorepati (KBC) was telecast on 6th September 2017. In which Amitabh Bachchan had asked contestants 17 questions of General Knowledge. The correct answer to all the questions is given below each question. By reading these questions, you can prepare yourself for the next KBC Season 10 of Kaun Banega Crorepati. Because by reading these questions, you will understand what kind of questions asks Amitabh Bachchan in KBC. These all general knowledge questions will be helpful to for you various Competitive Examinations and Interviews besides KBC. Remember, the answer to some question may be in accordance with that time, while the answer to those question may differ according to the present time. 1. In June 2016, which minister replied to a tweet thus, 'Brother I cannot help you in matters of a refrigerator. I am very busy with human beings in distress' ? 2. The name of which of these Indian missiles has been derived from the names of an Indian and Russian Rivers ? 3. Mother Teresa was declared a 'saint' by which of these popes ? 4. Which cricket team, along with Ireland, was given Test status in 2017 ? 5. Which of these prime ministers did not die while in office ? 6. In 2016, Which of these nations announced its decision to withdraw from the commonwealth of Nation ? 8. Which Indian city's name is also a word in Hindi for a person's face ? 9. Which of these Hindi idioms means "running away" ? 10. Government of India's Minimum Support Price (MSP) scheme helps to protect the interest of which group of people ? 11. Identify the film from this song. 12. Who is the second Indian batsman to hit a triple-hundred in Tests after Virendra Sehwag ? 13. In the Mahabharata, Ashwatthama is the name of Dronacharya's son as well as the name of which animal ? 14. The Sadhu-bet island, on which the Statue of Unity is to be built, is located on which river ? 15. Who was heading the Indian Army during the Bangladesh Liberation War of 1971? 16. Who became the first president of the Bharatiya Janata Party when it was formally established? 17. Which of these is the national calendar of India?